If you’re experiencing stress and aches and pains – magnesium just might be the mineral you are looking for. Not only does magnesium offer many health benefits, you can utilize it in many ways. 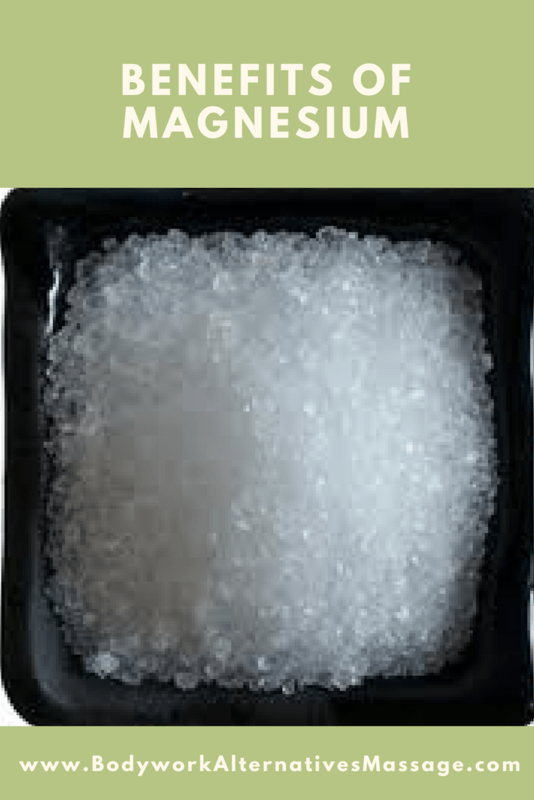 Magnesium is found in many delicious foods, you can soak in epsom salt baths, or you can take supplements. There are many foods to incorporate into your diet to increase your magnesium. Soaking in epsom salts is a great option to draw toxins out of the body, soothe the nervous system, reduce muscle aches and pain from magnesium deficiency or exercise, and reduce stress. Have fun with it! Add essential oils for more benefits or for aroma. Of course, there’s always the option to take a daily magnesium supplement. Speak with your doctor about the appropriate dosage for you. Bodywork Alternatives Onsite Massage, LLC provides on-site chair massage services for corporate and personal events such as employee corporate wellness health fairs, employee appreciation, customer appreciation, bridal parties, birthday parties, and more. Call us for your next event!